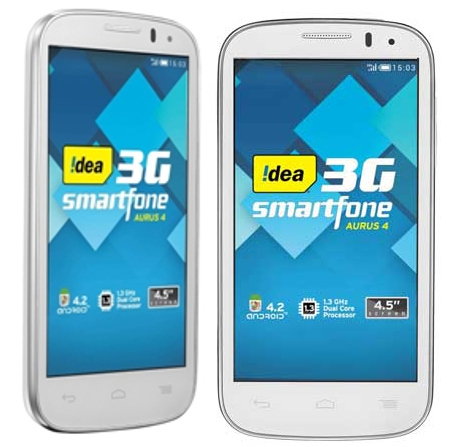 Idea cellular has launched a new budget dual core phone, the Aurus 4. The Aurus4 is priced at RS 9000 and at the same price you can Buy Gionee Gpad G3 with 5.5 inch display, 1GB RAM and quad core processor. But what company did to make the device attractive is that they are offering 250MB and 1.6GB of 3GB DATA and Idea TV subscription free for the first 3 months. The Aurus 4 comes with a 4.5inch FWVGA capacitive touch screen display, 1.3GHz dual core processor and Dual SIM support. To make the hardware run there is Android 4.2 Jelly bean OS and 512MB RAM to boost the performance. The smartphone packs with 5-megapixel primary shooter with LED flash and a VGA front facing camera. It has 3G, GPS, Bluetooth,FM radio, WiFi and micro USB connectivity. The Aurus 4 has 4GB of internal storage out of which 1.4GB is assigned for user, you can insert micro SD card up to 32GB for further expansion. The Idea Aurus 4 has 1800 mAh battery and it is priced at RS 8999. It will compete with Micromax Canvas Juice that has 1GB RAM and 1.3GHz CPU.